Fishguard Bay Ocean Race – FBOR’19 is a demanding, open sea offshore race for Surfskis and SUPs across 17km of deep water at the meeting of the Atlantic and the Irish Sea. 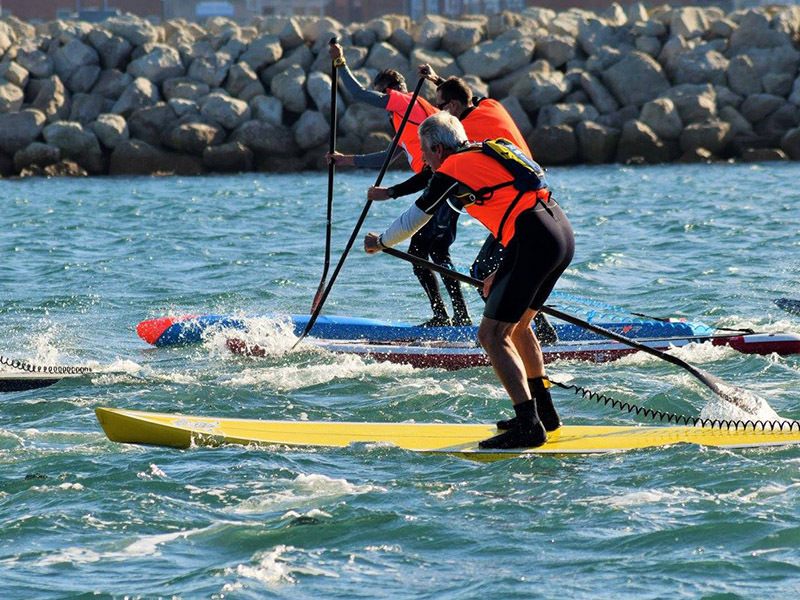 When the wind is optimal for racing the conditions can be both mentally and physically challenging for all but well prepared, fit and experienced paddlers. These courses work well for winds between SSW and NW – and we can run the race in reverse for winds from N through E to SE. The exact courses will be decided by Race and Safety Officers on race day and those shown on the map may be subject to adjustment to suit conditions. Our aim is to give you the best race possible (max downwind) while ensuring a sensible margin of safety. The race is intended to be a continuous and intense test of fitness, endurance, boat handling skills, seamanship and common sense for up to 1.5 hours. 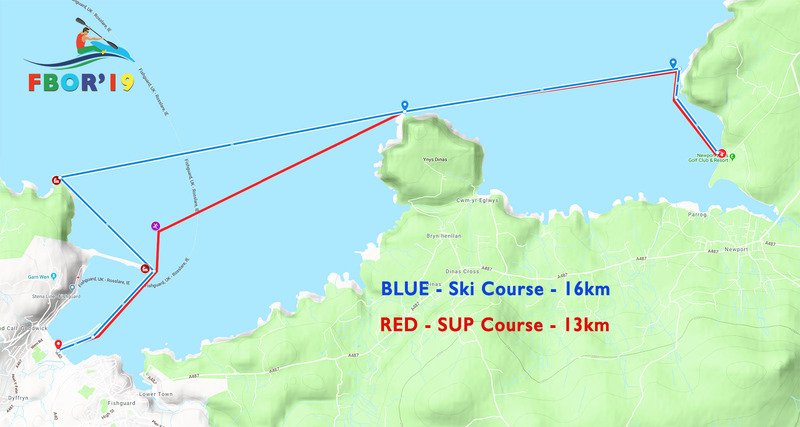 There are a few safe havens and pull-outs but, for much of the race, you will be up to 2.5km off shore. Confident self-rescue is essential. ARE ULTIMATELY RESPONSIBLE FOR YOUR OWN SAFETY. Registration 08:30 – 10.30 Saturday 11th May – Ocean Lab Car Park. Start will be 11:30 sharp! Goodwick to Newport Sands car park is 11 miles (25mins) on country roads each way – so please allow at least an hour for the round trip. We’ll be having another another delicious discounted meal (venue to be confirmed) – come and join the fun and banter! As a race committee we have to be sure that every competitor who enters this race is capable, in all the above respects, to successfully complete the course. So, to enter the race online you will be required to agree to a waiver release (see below) and, at registration on Saturday 11th May, we will require proof of your successfully completing a minimum of one 15+km ocean downwind race within the last 12 months. Any paddler NOT having an established record of safe finishes in equivalent races must prove their fitness and competence to the race officer before or at registration, preferably by being vouched for by organisers of other races, or you will be excluded from The Race. At the very least, the waiver (below), which you will be asked to sign in person as hard copy at registration, will be your statement of assurance to the Race Officer that you are fit and capable of safely finishing The Race. All Surfski and OC entrants are to wear PFD’s, leg or paddle leashes and carry a mobile phone in a waterproof pouch attached to PFD’s and or (preferably) a VHF radio. O2 mobile reception is very poor in the Fishguard to Newport area so communication will be uncertain. Orange Smoke Flares are also mandatory (available at Registration). All SUP entrants are to wear PFD’s, leg leash and carry a mobile phone in a waterproof pouch attached to PFD’s and or (preferably) a VHF radio. Note: O2 mobile reception is very poor in the Fishguard to Newport area so communication will be uncertain. Orange Smoke Flares are also mandatory (available at Registration). Please note that, in the event of an emergency, the rescue crews have been briefed to prioritise the survival and safety of the casualty above recovery of boat or equipment. “I have read the above description of the Fishguard Bay Ocean Race (The Race) and confirm that I have solid and provable experience in the expected conditions (up to Beaufort force 6) and duration (16km and 1.5 hours) of The Race. I take full responsibility for the accuracy of my declared experience and competence as provided to the race officer and declare that I am fit and capable of successfully and safely finishing The Race without assistance. Your safety, the safety of your craft, its entire equipment, including insurance, shall be the sole responsibility of the owner/paddler racing the ski or canoe. Where a ski or canoe has been borrowed/rented/hired, etc. it is the paddler’s responsibility that the vessel meets the required standard and insurance requirements. 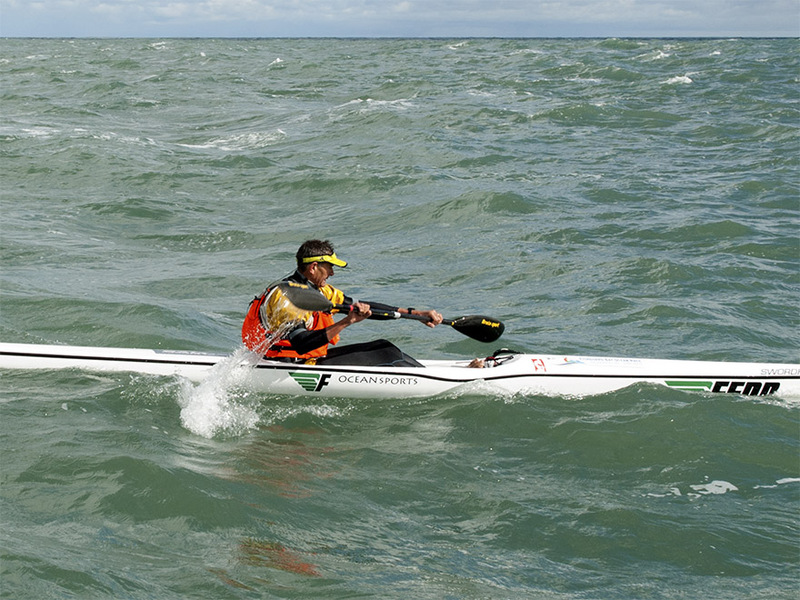 When taking part in this race you agree to abide by GB Oceanski / Canoe Wales rules.